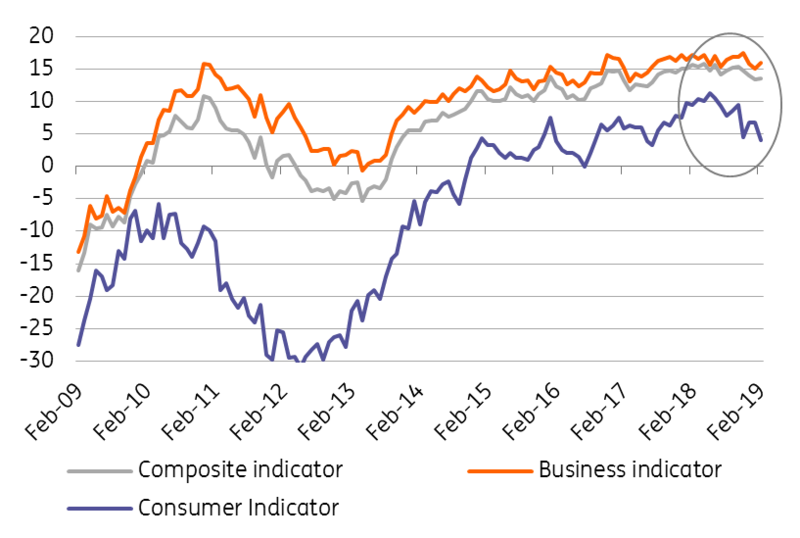 Consumer confidence declined slightly in February and remains at the lowest point since mid-2017. Generally, households are more concerned about the overall economic situation, which is probably related to the uncertainty regarding the economic slowdown ahead. But on the whole, households are still positive about their financial situation, which remains at a record high. Combined with concerns about future developments, this leads to a higher willingness to save, although this has declined slightly compared to January. Although household confidence is the weakest over the year, it remains at a favourable level in the long term. Households continue to benefit from rising wages and the overheated labour market, and consumption should be among the main drivers of domestic economic growth this year. Confidence among entrepreneurs rose slightly in February, which is mainly due to improving confidence in services, and also slightly in the industry. In both segments, expectations for future developments have improved, which has been decreasing in the previous months. However, in general, confidence is currently above average and close to its historically highest levels of services and construction, while in industry and retail trade are lower than in the previous years. Although GDP growth in 4Q18 positively surprised, the soft indicators from 2019 are still relatively weak and confirm the slowdown ahead. The same holds for Germany's confidence indicators, which suggest economic growth in the first quarter of this year will not be much faster than what we've seen in the second half of 2018. From the perspective of the Czech central bank, the situation is still ambiguous: while domestic conditions could allow rates to rise closer to the neutral level, foreign risks remain elevated. More information can be gleaned from the structure of GDP growth published on Friday and 4Q18 wage growth. In our view, the central bank will hike in May at the latest due to a weak koruna and the assumption that the external environment will begin to improve.